Front rise: 10" ; inseam: 31" ; leg opening: 5 1/2"
These jeans are nice looking and could be worn with anything. Love these high rise jeans! 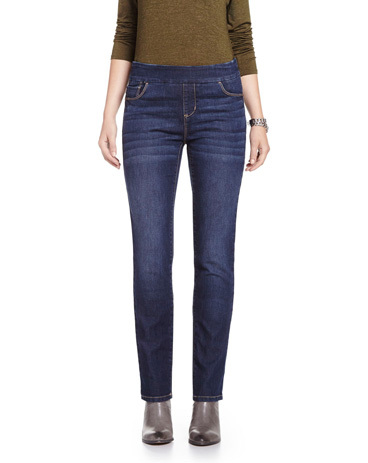 Great comfortable wear all day kind of jeans! Wash and wear well! This is good for casual wear and still looks elegant. These jeans fit and feel great. I can dress them up for work and look cute rolled up with a bootie. Great fit, wonderful colour. Very flattering and hallalujah - a high waist !!!! No muffin top - lovely smooth outline finally a pair of jeans that are comfortable, attractive and flattering. Like the rise, fit, style wash. If the pockets were a smidge lower I'd be even happier. That makes for a more flattering rear in my opinion. Great anyway.